Pluto is an extremely cold planet with quite a lot of ice. So much so that New Horizons discovered that it even tilted Pluto to its side. A few months ago, space probe New Horizons flew past Pluto. The advanced equipment it has on board includes a device that detects solarwinds, an ultraviolet detector, and a multitude of cameras and telescopes. These cameras have already taken extremely detailed pictures of Pluto, revealing things about the dwarf planet that we had no idea about previously. For example, we now know that our previous information about Pluto’s size was inaccurate; it is a bit bigger than we thought, but unfortunately still not big enough to be classified as a planet. New Horizons also discovered that a large part of Pluto is covered by a tear-shaped ice cap which is so big and so heavy that scientists think that it has actually caused the dwarf planet’s tilt. Pluto’s rotational axis is tilted about 60 degrees. Previously, scientists had no idea what the reason was. Now, James Keane and his team think it has something to do with the enormous ice cap, Sputnik Planitia. They think that the ice cap is so heavy that it has actually tipped over the dwarf planet a little. Imagine Pluto as a frisbee and the ice cap as a small weight stuck to one side of the frisbee. If you throw the frisbee, it will tilt to the side because of the weight; the same thing has happened to Pluto. But there’s something else that’s a bit odd about the icecap that has to do with Pluto’s moon. Pluto and its biggest moon, Charon, are always facing each other with the same side. So a Plutonian would only ever see one side of Charon and a creature living on Charon would only see one side of Pluto. Pluto and Charon seem to be connected to each other by an imaginary bar. The ice cap however, is located exactly opposite to the side that’s facing Charon. So our Charon-creature would never see the icecap. And this is exactly one of the places where a heavy weight like the ice cap could be located without tilting the dwarf planet further. 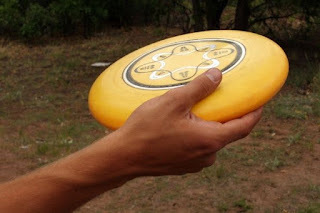 If you imagine the frisbee with the weight again, but now, you stick the weight exactly in the center of the frisbee. Then it won’t tilt to the side anymore when you throw it. The same is true for the location of the ice cap on Pluto, because Charon keeps the dwarf planet in check. But the problem is, we can only guess how heavy the icecap is. And how it actually influences Pluto’s gravity. To study this more closely, we need a satellite orbiting around Pluto. This satellite could then study closely how Pluto’s gravity field behaves, and if the ice cap actually has any effect on it. This won’t happen anytime soon however, since it’s incredibly difficult and expensive to get a satellite in orbit around such a distant dwarf planet. 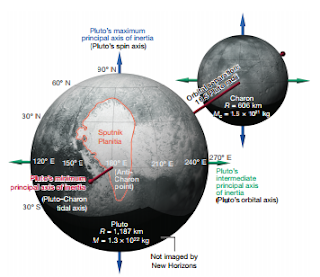 But for now, it’s a good explanation for Pluto’s tipped axis and the location of Sputnik Planitia. Click here to read more about astronomy. Not only a new president; also new solar panels!